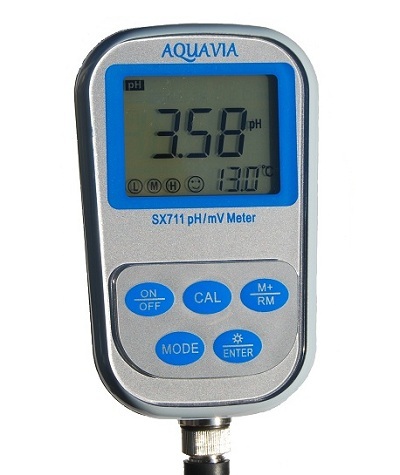 SX711 Portable pH/mV/Temp Meter Kit - Oasis Scientific Inc.
· Three-point push-button calibration with auto-buffer recognition and automatic temperature compensation. · Choose from USA or NIST buffer sets. · Automatic shutoff function, and low battery indication. · Memory function stores and recalls up to 200 data sets. · Waterproof and dustproof body meets IP57 standard. 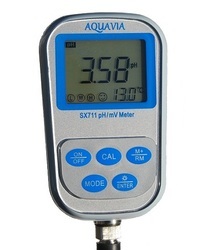 Ergonomically designed, SX711 portable meter measures pH, mV, and temperature with high resolution and accuracy. The meter features automatic temperature compensation, automatic 1~3 point pH calibration, auto buffer recognition of USA or NIST, storage of 200 data sets, ready indicator, auto shutoff function, low battery indication, and self diagnostics. 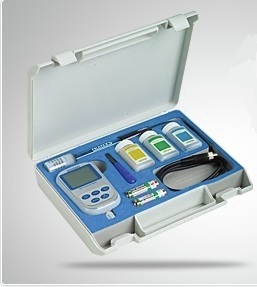 The complete kit includes pH meter, plastic pH/ATC three-in-one combination electrode, pH buffer solutions, user’s manual, screw driver, batteries, and plastic carrying case, making it ideally suited for general lab use, environmental field applications, and teaching.